The Plastics Industry Association (previousl SPI) follows a plastic coding system that requires a number (1 – 7) on each plastic product that is manufactured. 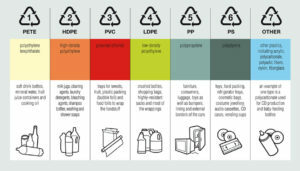 This is particularly helpful for those interested in recycling plastic as knowledge about the 7 types of plastics can help recyclers sort their materials more effectively. 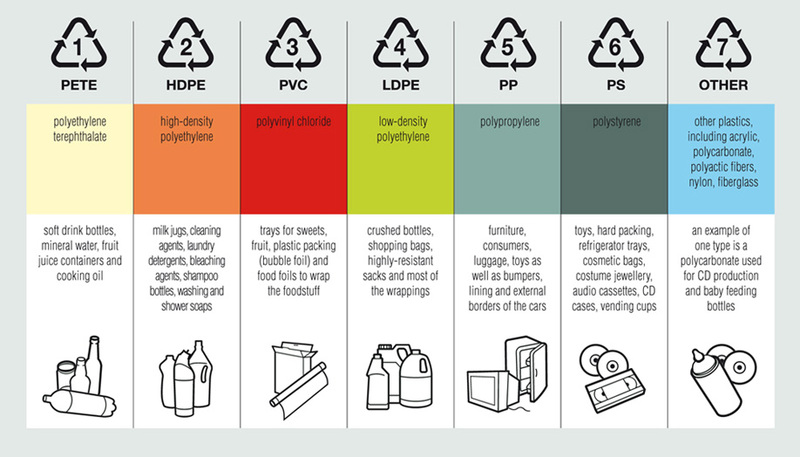 It can be helpful to always verify the plastic classification number of each product you use, especially if you plan on recycling it, This guide provides a basic outline of the different plastic types associated with each code number. The number 1 in the plastic coding system refers to all items made with PET or PETE (polyethylene terephthalate). Many PET products are containers that often have the residue of the food and drink that are retained within. PET and PETE are commonly recycled. Plastic bottles and jars are the main items along with combs, tote bags, carpeting and rope. PET bottles and containers have a 96% market share in the United Staters. Number 2 in the plastic coding system refers to HDPE (high-density polyethylene). HDPE plastic products are known for their protective fabrication and the prevention of any chemical seepage into foods or beverages. Still, reuse should be limited. It is not considered safe to utilize an HDPE container for food or drink unless that was its original purpose. Like PET, HDPE products are frequently recycled. Items made from HDPE include packaging for shampoo, milk, soap and detergents. The recycling of HDPE often produces fencing, crates and lumber. Material labeled with the plastic coding system of 3 is made with PVC (polyvinyl chloride). Their applications are generally divided on the basis of the hardness of products – rigid or flexible. While its often used to make pipes and tiles, PVC is usually found in plumbing pipes. PVC can be harmful if swallowed, and it is not recycled as often as PET and HDPE. . Recycled PVC is used to make binders, cables, carpet backing, flooring, park benches, pipe, speed bumps and traffic cones. The plastic marked with a code of 4 is the material LDPE (low-density polyethylene). While it is durable and flexible LDPE does not have a significant recycling footprint, but it is certainly recyclable in particular areas. Harmful chemicals are not a concern with LDPE and food storage applications are usually a good fit. Plastic grocery bags, sandwich bags, squeezable bottles are manufactured with LDPE. When it is recycled, LDPE is used to make household products, garbage cans, lumber, furniture and many other low-end items. Currently, many recycling programs are learning how to work with LDPE products and less and less of the material will be landfill-bound in the future. Items made with PP (polypropylene) are #5 in the plastic coding system. Polypropylene can be recycled but, like LDPE, it has a relatively small footprint in this sector (about 3% of polypropylene products are recycled in the US). PP is strong and is known for its ability to withstand very high temperatures. Tupperware is manufactured with PP as are many bottle types and caps, stadium cups, diapers, yogurt boxes and margarine containers. When it is recycled, PP is used to make items that have a durable quality. Battery cables, rakes, ice scrapers, brooms, bins and trays are common applications. Plastic marked with a of 6 is made with polystyrene (PS), more commonly known Styrofoam. Yes, PS can be recycled, but not very efficiently. While technology is improving, recycling PC currently takes a lot of energy and few recyclers are inclined to deal with it. Disposable coffee cups, plastic food boxes, plastic cutlery, packing foam, and packing peanuts are made from PS. Recycled PS is used to make many different kinds of products, including rulers, jewelry cases, disposable cutlery, insulation, license plate frames and hot lids. The plastic coding system uses #7 to designate miscellaneous types of plastic that are not defined by the other codes. Polycarbonate (PC), used in the manufacture of CDs, DVDs, baby bottles, large water bottles and medical storage containers, is included in the number 7 category. This type of plastic is difficult to recycle. Recycled polycarbonate is most often used to make plastic lumber, among other products. Many BPA products are in the #7 category. BPA is an industrial chemical that has been used to make certain plastics and resins for several decades. BPA is often found in polycarbonate plastics and epoxy resins.